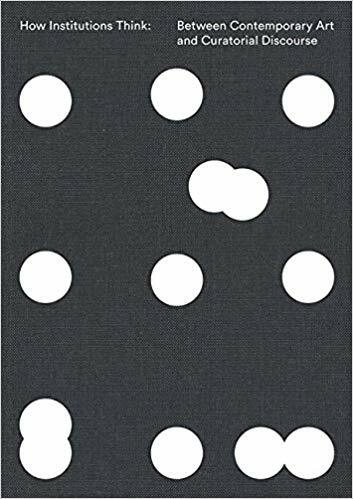 This edited volume reimagines contemporary art’s institutional formats, practices, ethics, and dispositions, and, in doing so, attempts to expand on the analyses conducted by the late social anthropologist Mary Douglas in her seminal text How Institutions Think (1986). The second of a three-part series, the book is the result of a series of symposia under the same title (Arles, 2016) organized in partnership with the LUMA Foundation, The Center for Curatorial Studies (Bard College, New York) and various international curatorial schools. The essays bring together an international network of established artists, curators, educators, and practitioners from the academic and contemporary art worlds to engage with institutional “thinking” across multiple disciplines, including political theory, organizational science, architecture, and sociology. This book represents a growing inter- and trans-disciplinary body of contemporary institutional discourse and practice. Within the last fifteen years, there has been a proliferation of debates and entanglements between contemporary art and curatorial praxis, to which the editors of this volume have themselves greatly contributed through their own work, as well as with their previous co-edited publication The Curatorial Conundrum: What to Study, What to Research? What to Practice? (2016). These debates fall along two main lines: 1) the decentering of the artist and the rise of the curator in the production of agency and critique; and 2) overcoming the “systemic recuperation of critique” to produce social transformation. In Art and Contemporary Critical Practice (2009), Gerald Raunig attempted to resolve these debates with his notion of instituent practices: the fusion of social criticism, institutional critique, and self-criticism. He argued that institutional critique is never confined to the art field and that critique always evolves with changing societies. However, fears of the recuperation of anti-establishment critiques by art institutions themselves, where forms of resistance and critique become re-appropriated and re-packaged by the institution and thus neutralized by the institution, has tended to stymie further discussions. This new edited volume approaches this impasse by expanding on what an institution is or can be from various pragmatic, philosophical, and imaginative perspectives. The study of social institutions as organizational systems that shape societies and their interactions has a well-established lineage within European sociological and philosophical thought. Writers from Max Weber and Karl Marx to Emile Durkheim, Pierre Bourdieu, and Anthony Giddens have developed ideas relating to institutionally embodied notions of structure, agency, function, and culture. In How Institutions Think (1986), Mary Douglas traced the sociology of knowledge through concepts developed by Durkheim and Ludwik Fleck, such as “thought collectives” and “thought style” that interrogate the extent to which institutions shape social perception and cognition. A main argument she advanced is that institutional codes enable similar modes of thinking and acting among individuals. For the editors of this volume, Douglas’s provocations are something of a “proximate spectre” (21).They function as a “polemical statement and loose framing device,” opening a series of interpretations within the contemporary art field and prompting a reconsideration of the “the practices, habits, models, revisions, and rhetoric of the institution and anti-institution in contemporary art and curating” (21). The book’s main goal in going beyond Douglas is to determine the requirements (resources, skills, knowledge) needed for building decolonial, ethical, research-based institutions for the future. Over a series of twenty essays, neatly categorized into two sections—“Thinking Via Institutions” and “Thinking About Institutions” —it becomes evident that contemporary art institutions, in theory and in practice, are thinking agentially, infrastructurally, and dispositionally, in the tradition of Foucault and Deleuze. While considering ontological approaches to institutionalized forms (how they come into being), the authors are concerned primarily with knowledge and power relations between actors and publics, as well as within constitutional and organizational structures, and consequently, many analyses explore habits and norms that structure an institution’s social appearance. The essays in the first half of the book provide useful case studies and descriptions of practices that emphasize the possibilities for invention and renewal, both with and from within the institution, as Nataša Petrešin Bachelez asserts in her chapter “On Slow Institutions.” Patricia Falguières’s definition of “instituting” in “Institution, Invention, Possibility,” articulated as a series of operations, or “theatre of procedures” transmitted over time, establishes the theme of institutional inheritance echoed in the essays that follow. Falguières believes that this genealogical aspect holds the potential for institutional renewal and invention. A reconsideration of Mary Douglas’s chapter “Institutions Remember and Forget” prompts several essays and reflections on institutional time, colonially inherited collections, and the agency of cultural objects, which are all intrinsic to processes of decolonization among diverse publics. The main question that emerges here is whether institutions should retain their colonial structures by re-purposing collections as pedagogical tools towards new knowledge economies or build entirely new ones. Petrešin Bachelez opts for the former, emphasizing the possibilities of collaboration among diverse cultural publics through processes of archival recovery and resisting capitalist-driven modes of production by cultivating a methodology “of care”—an institutional approach to listening and collaboration that enables other values to emerge while expressing an ongoing commitment to social, cultural, and gender issues among marginalized groups. Likewise, Clémentine Deliss and Mélanie Bouteloup see potential in repurposing archives, facilitating their public use as pedagogical tools in creating alternatives to national archival structures and the hegemonic narratives they produce. Deliss questions the efficacy of the museum collection as a site of critical resistance in “dark venues”—museums conceptualized as colonial mausoleums of the past—and argues for a new type of a “post-ethnographic” museum-university, one that involves transferring ownership of the collections to the public, bypassing legal and copyright hurdles, while generating shared knowledge domains. Although these are relevant concerns for archives and museums, without providing concrete case studies, as Deliss and Bachelez do, the essays in this section only illustrate the extent to which institutions still regulate, even idealize, the terms of decolonial engagement by ascribing value and ownership to collections, when in fact values differ among diverse source communities. Some authors propose methods of centering processual or relational forms of knowledge production that engage Raunig’s conception of instituent practices by reassessing the internal habits, norms, behaviours, and formal arrangements that constitute the rhetoric of the institution. For Binna Choi and Annette Kraus, this involves working with diverse groups and participants to restructure institutional habits. This, they claim, will “activate art’s radical imagination” (66). Pip Day’s essay, as well as Emily Pethick’s in the second half of the book, offer similar approaches that centre Indigenous and decolonial methods of “relationality,” “self-determination,” and “unsettling” to actively engage local, site-specific politics, discourses, and diverse publics. These essays provide useful models for approaching instituent practices that engage wider communities in cultivating shared knowledge domains. Day’s essay on decolonization may well be following the perspectives of Indigenous scholar Shawn Wilson, who would have been important to mention in this context, since he coined the term “relational accountability”—an Indigenous research methodology that prioritizes relationships as the ethical, ceremonial, and processual bedrock of all research practices. Douglas’s chapter on “Institutions Make Life and Death Decisions” seems to have inspired many of the essays in this volume. Moses Serubiri and Mick Wilson, with their propositions on death as a form of institutionalized othering or erasure, provided two of the more intriguing and important proposals for alternative art historiographies. Serubiri’s “Death and the Stone Age” discusses the Uganda Museum’s ethnographic collection, its problematic exhibitionary history, and its role in rewriting Ugandan history in relation to a network of institutionalized actors and artists. In response to a colonially inherited legacy of Eurocentric projections onto African art (e.g., poised between a mythic past and affinity with the modern) that have influenced neo-colonial structures across various institutional domains, Serubri builds a convincing, complex case for thinking through institutionalized othering. Similarly, Wilson outlines a co-productive form of instituting with the dead that recognizes them as political communities endowed with agency. Simon Sheikh’s reflections on death, absence, and negation (of historically marginalized or silenced subjects) in the first essay of the second section provide a wonderful transition to “Thinking About Institutions.” Sheikh argues that, beyond programming, instituting also involves the production of space, social relations, and subjectivity. Sheikh, like others in this section, rely on Foucauldian conceptualizations of systems of discipline, order, and control that necessitate spatial understandings of institutionalized forms and expressions. The theme of structural omissions raised in Dave Beech’s historiographical essay concerning the shifting subjects of agency and critique in art (again building on Raunig) prefigures the inquiries that follow in the volume, such as Nikita Yingqian Cai’s “Can an Institution Speak for a Woman?” and Sarah Pierce’s “Practices of Negation,” which both articulate the emancipatory creative potential of revealing the absences and silences of the archive. In “A Total Education,” by Fred Moten and Stefano Harney, spatialized conceptions of racialized subjects create an interesting dialogue with Kelly Easterling’s previous essay, in which she raises the theme of “disposition,” or arrangement, in the context of economic enterprises in the developing world. Morten and Harney argue that there is a type of structural antagonism built into the idea of a “total education”: the creation of institutionalized subjects as human capital subjected to genealogical cycles of dispossession, instruction, and reform. The theme of antagonism carries over into the dense conceptual terrain of El Baroni’s development of a theory of a post-agonistic institution, based on Chantal Mouffe’s “agnostic pluralism.” El Baroni postulates a pluralized conception of the democratic public sphere that harnesses political conflict towards productive ends and seeks to use Mouffe’s concept as a blueprint for analyzing how conflict has been historically enabled, what intersubjective dialogues it has produced, and how it can produce new perspectives. The essays in this volume demonstrate remarkable theoretical feats and operate simultaneously within inter- and trans-disciplinary zones. The readings are indeed provocative and have the potential for developing more concrete reformulations of the self, identity, agency, and history within institutions. However, some essays in the book (for example Falguières, Moten and Stefano, and Marina Gržinić) are obfuscated through abstruse language. This is perhaps symptomatic of the continued reliance on continental theory that has become the institutionalized language of the academy. Moreover, the adoption of Douglas’s work as a “loose framing” device, though it has enabled possibilities for discussing what an institution can be, has limited the scope of engagement, providing little space (six pages) to fully develop and tease out the arguments and conceptual devices of other prior literature. A reliance on texts that are not grounded in practical, real-world situations (Chantal Mouffe’s essay “Deliberative Democracy or Agonistic Pluralism?” is a good example) not only enables misleadingly seductive argumentation that appears “radical,” but also creates a muddled discursiveness across twenty densely packed essays. Despite this, the decolonial thrust of the book, evidenced by the numerous postcolonial and scholars who are cited including, Gayatri Spivak, Léopold Senghor, Walter Mignolo, as well as a few Indigenous scholars cited in Day’s essay including Leanne Simpson, Tanya Lukin Linklater and cheyanne turions, reflect a positive desire to move away from Eurocentric modes of instituting. Together they prompt very interesting alternative historiographical and locally contextualized discussions of art institutions, not only in Europe and North-American metropolitan centres, but also in Uganda, Singapore, China, Russia, the Middle East, and South America. Overall, How Institutions Think offers a series of thoughtful, intellectually provocative, and imaginative essays on institutions and the function of critique. It caters to an advanced readership (perhaps including ambitious graduate students) interested in institutional history and discourse across several disciplines and subdisciplines. The case studies presented may also be useful for librarians, archivists, and those wishing to engage more deeply with sociological and decolonial approaches to art, curating, and knowledge production. Charissa von Harringa is a PhD student at Concordia University. Mary Douglas, How Institutions Think (Syracuse, NY: Syracuse University Press, 1986). Pierre Bourdieu originally developed the idea of the “systemic recuperation of critique” in the sociology of art. See Pierre Bourdieu, The Field of Cultural Production (Cambridge: Polity, 1993), 83. Shawn Wilson, Research is Ceremony: Indigenous Research Methods (Halifax and Winnipeg: Fernwood Publishing, 2008). For a more comprehensive analysis of “disposition” in this context, see Kelly Easterling, Extrastatecraft: The Power of Infrastructure Space (London, New York: Verso Books, 2014). Chantal Mouffe, “Deliberative Democracy or Agonistic Pluralism?,” Social Research 66, 3, (Fall 1999): 745-758.